I bought this rack of pork several months ago and it's been sitting in my freezer for quite a while. I finally decided to thaw it out and do something with it. I guess I was procrastinating for so long because I've never cooked one before. So I scoured the web for a recipe that looked good and I came across Chef Dennis' recipe for Oven Roasted Rack of Pork. I only made a few small changes to the recipe. I didn't have any carrots and I forgot the garlic but I did add garlic to the pan sauce at the end. I also added leeks and used a red onion instead of yellow. I didn't have any Montreal Seasoning so I made my own using a recipe I found on Food.com. I gotta say I was pleasantly surprised at how easy it was to make and how well it turned out. It was cooked perfectly and was juicy and tender all the way through. The only thing is it was a huge amount of food for 1-2 people. I've been eating leftovers of it for lunch and dinner all week. I probably should have froze some of it. Add onion, leek and celery to a roasting pan. Rinse rack of pork, pat dry and place fat side up on top of vegetables. 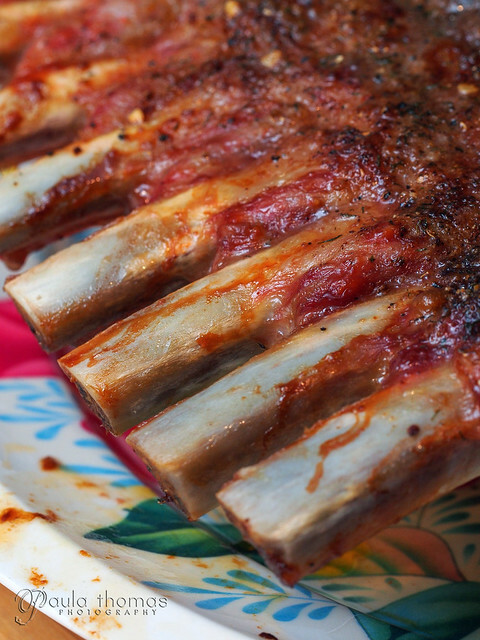 Rub the rack liberally with olive oil and sprinkle the rack with salt, pepper and a good amount of Montreal Seasoning. Bake uncovered in oven for 15 minutes. Reduce heat to 325 degrees and roast for approximately 2 hours more or until meat thermometer reaches 160 degrees on outside of rack. Remove rack from oven and let rest for 10 minutes before slicing. While rack is resting, make pan sauce by placing pan on the stove over medium heat and adding 2 cups of water and the garlic to the roasting pan with the vegetables. Use a wooden spoon to scrape the bottom of the pan and loosen any bits stuck to the bottom of the pan. Strain out the vegetables and reserve the sauce. 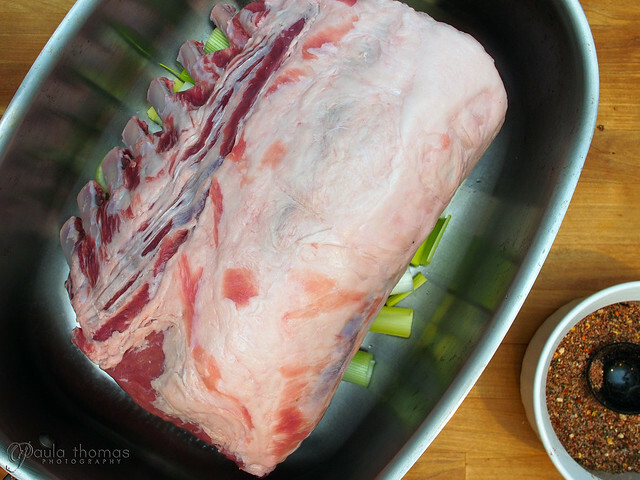 Cut the rack between the bones and serve with the pan gravy.